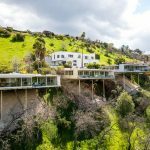 A famous house that is built on stilts in California is on the market with a price tag of $1.5 million. A 17-house enclave that was built by influential modernist architect Richard Neutra 1966, near the end of his life. Now one of the properties that is perched at the summit of a canyon in Sherman Oaks in San Fernando Valley is available to purchase. Overlooking Beverly Glen Boulevard, the homes are suspended over a hillside and are supported mainly by a few long poles extending from the terrain below.